Your dog will be flying in style with this airplane dog collar. This is an aviation themed adjustable 1 inch collar. 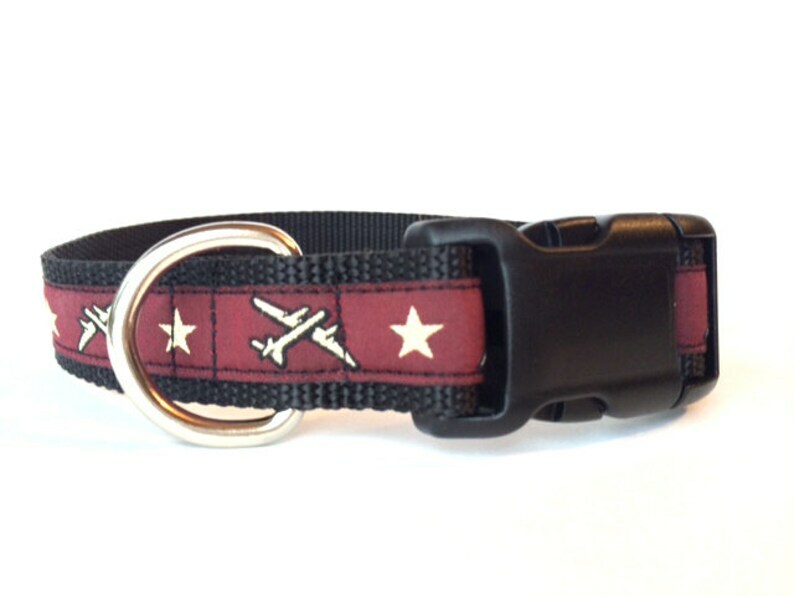 It is made with a 5/8" maroon/burgundy jacquard ribbon featuring airplanes and stars that is attached to 1 inch black heavy-duty nylon webbing using interfacing and high-quality thread (triple sewn on pull-points). The hardware is plastic (a contoured, quick-release buckle and slip-lock) and a welded nickle D-ring. If you need the collar in a different size or width (can be placed on a 5/8" webbing or 3/4" webbing - but *Please Note * that the black border on each side of the ribbon will get smaller as the width of the webbing gets smaller) - please contact me and I can create a custom order for you. Also contact me if you are unsure of which size to order and I can help you pick the best fit.